Yes, I know the horizon is wonky at the moment! It doesn’t matter at this stage. However, there are several decisions to be made (and it’s not until you write them down, do you realise the amount of decisions you make when painting). Take this excerpt from my recent email to the client, describing what I’m weighing up at this stage in the painting. What do you think about the beach? The sea currently comes in as far as the rocks and the area between the rock is still ‘dry land’. I’ve left it as it is for now. The sandy areas between the rocks might end up being reflective pools as if the tide has gone out, or the indents in the sand caused by the drag of the tide, as in the foreground. The first strip of sea that’s lighter is likely to mirror the sky – orangey streaks, etc. The area to the right is becoming swirly, whitewash water with aqua colours, it looks like a fairly large area of shallow water at the moment. 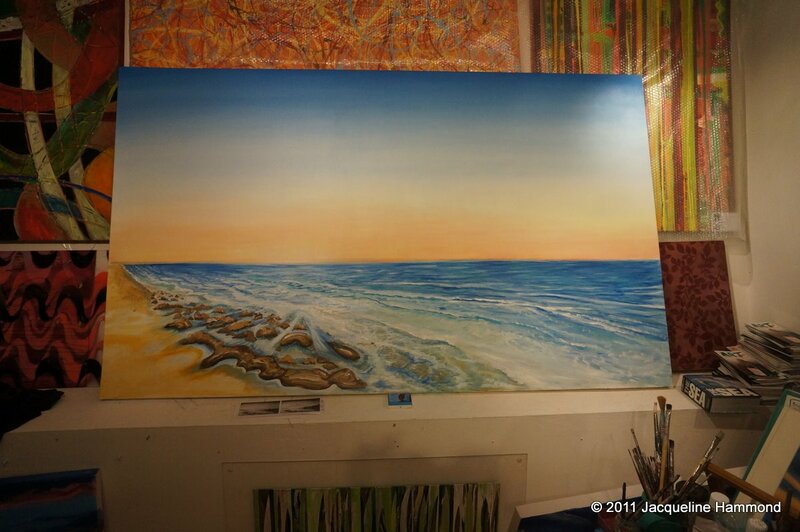 The rocky area at the bottom right is where the sea could come in further – either the rocks go or become submerged (this is where there is an element of going ‘with the painting’ as to what works) or end up being painted over but I am aware you didn’t want ‘too much beach’. The painting of the beach / sea looks quite spontaneous at the moment. I don’t want to ‘overwork it’ and make too ‘photo realist’ but more detail in the rocks, for example, will make them less abstract. The sea has more colours, tones, ripples, detail to add. As the clouds are yet to come, the ‘light’ is not established yet. Once the clouds are established I’ll get a sense of the overall light effect on the scene. The sky reflecting on the sea, pools, shallow area. It feels ‘warm’ to look at, at the moment, if you know what I mean! I have a few diff ideas for the clouds / sky that will sketch out based on our previous discussion and notes / images… but I’d appreciate you making any thoughts you have on this known at this stage, now that you have seen the painting. Or you can just trust me! Now, the placement of the boat is trickier… instinct from the composition, the rocks point towards a focal point in which the boat could be placed. This is the most obvious position for the boat. Here it would be in the distance and look something like (image ‘boat 1’ or ‘boat 2’ when painted. The detail of the reflection might go as far back as the pools then… not sure! Remember I mentioned about the boat heading from left to right? Well, the other option is to have the boat further to the right. This would make it closer and more detailed – particularly if you want the kind of reflections in the images of the boats you liked, such as ‘boat 3’. However, in the shallow, reflective areas of the sea, it wouldn’t look like these images. Aspects of these decisions are a bit speculative anyway. I will go with ‘what works’ as I’m not painting what’s in front of me and because it’s important that all the elements of the painting work together. But before I go any further, it’s your chance to check I’m going in the right direction, state preferences and make any suggestions. This entry was posted in Uncategorized and tagged Art, artist, beach, beauty, blue, commission, decisions, imagination, light, Local News - Brighton, oils, paint, painter, picture, progress, sea, sky, sunny, sunrise, sunset, view, waves, work. Bookmark the permalink.